Ten diesel-electric switchers built by General Electric at their Eire Pennsylvania plant in 1936 were the first diesel locomotives purchased by the New Haven in quantity. These 10 switchers classified by the railroad as DEY-2 (Diesel,Electric,Yard-2) and DEY-2a were preceded on the New Haven roster only by a single diesel switcher (DEY-1) built by Alco in 1931, road number 0900. These 10 DEY-2 class switchers with road numbers 0901-0910 were purpose built for yard work only, intended to do the work of and equal the clearance profile of the roads 0-6-0 T-2b steam switchers. Although these locomotives may appear to be small road switchers their double reduction gearing limited them to a top speed of 20 MPH making them unfit for over the road work. All 10 switchers were constructed identically with the exception of the prime movers. Powering the five DEY-2 classification were Cooper-Bessemer 660HP diesels, road numbers 0901-0905. Powering the five DEY-2a classification were Ingersoll-Rand 600HP diesels, road numbers 0906-0910. Uniquely these in-line 8 cylinder prime movers from different manufactures where completely interchangeable if necessary by the use of a flexible coupling between the engine and generator. 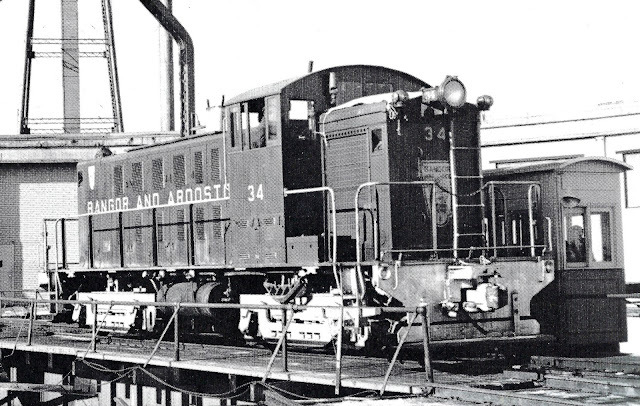 The five DEY-2 switchers were on the New Haven roster until 1952 when they were sold to the Bangor And Aroostook RR serving there until the 1960's. 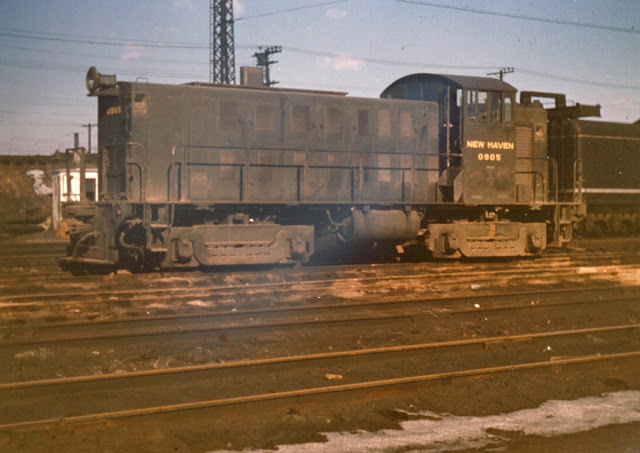 The New Haven kept the five DEY-2a switchers until 1953 when they were sold to a dealer for resale. 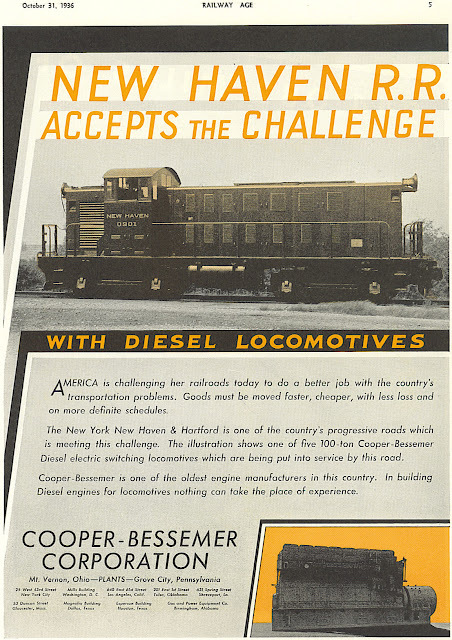 Below is a Cooper-Bessemer add from Railway Age Magazine Oct 1936 with photos of DEY-2 #0901 and 660HP prime mover. DEY-2a #0907 at the GE plant. Once again the New Haven Railroad Historical & Technical Association (www.nhrhta.org) has offered considerable information and photos over the years of the DEY-2 class locomotives. 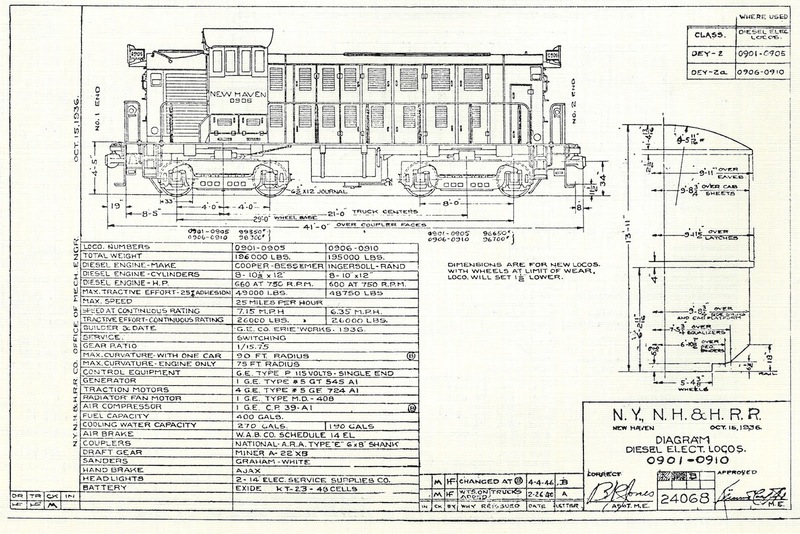 The Diesel Locomotive, Rail Car and Gas Electric Diagram Book published by the association in 1971 with a second edition in 78 contains the official New Haven RR diagram with specifications of locomotives 0901-0910 as drafted in 1936, see below. The association's magazine, Shoreliner, first had an article about these switchers in Volume 3 in 1972. 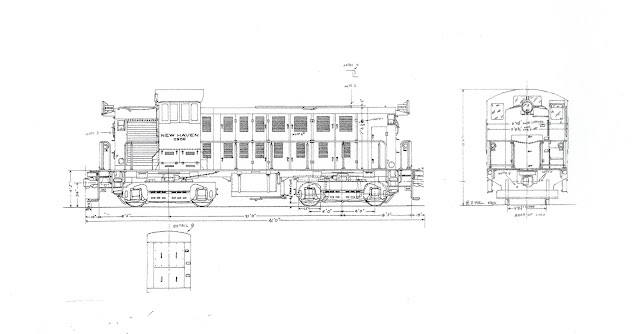 The author Ronald A. Fraser traced the original General Electric drawing number PP-2745969, this tracing is shown below. This reference drawing was used to build a model of a DEY-2 because it is the original GE drawing and it also includes end views, the drawing was resized to HO scale to further aid the modeling project. A second article in the Shoreliner, The New Haven's DEY-2 Ingersoll-Rand Switchers, authored by C. A. Brown published in 1985 provides more information and many additional photos. Unfortunately all three of these publications are out of print and no longer available from the NHRHTA. 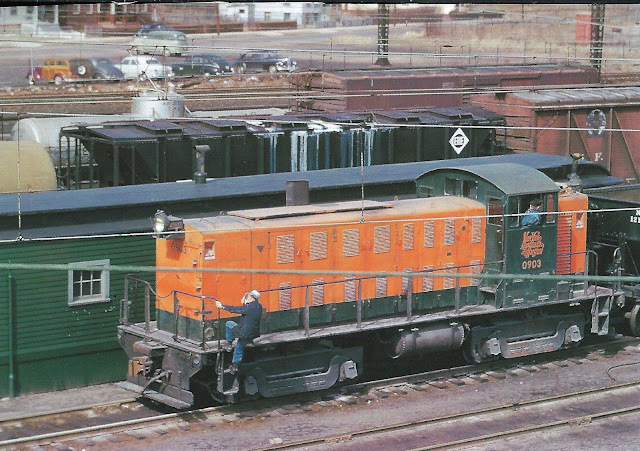 Additional DEY-2 reference and photos are included in the J. W. Swanberg book, New Haven Power 1838-1968. Long considered the "Bible" of New Haven equipment this 600 page book is still available from book dealers. Color photos of the two paint schemes used on the DEY-2. Below the original solid green with gold lettering and black frame. The later scheme with orange/green hoods, solid green cab and black frame. The modeling era of my Berkshire layout is 1957, so why model a locomotive that was off the roster in 1952 and never on Berkshire rails? As stated in the journal introduction, I enjoy the challenge of building a subject that has not been modeled before and had never seen a model of a DEY-2 in any scale. More importantly, these locomotives are so unique I had to have one! The modeled DEY-2 in the second paint scheme below will be switching Danbury yard in 1957 when the prototype era police are not present. 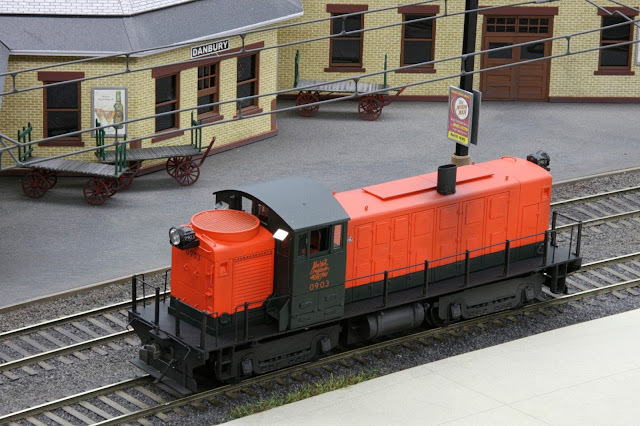 Next post will start a series on modeling this switcher in HO scale. That is fantastic, Joe! I'm looking forward to the upcoming series on modeling this switcher. Loved seeing this in person a while back - and really looking forward to the details on your process for modeling it! Looks good wish I could make one!! !